Presenting the ASA "I Can" Full Ebonite Stylish Fountain Pen. General Description- The ASA "I Can"is a handsome fountain pen. The pen is Long pen with an excellent balance. Its long barrel and well designed ebonite section provides, good balance, comfortable grip and stress free writing experience. The pen sports a good quality, stylish tear-drop, steel clip. The Cap Top is kept long to give a style to cap. Overall a very handome pen and for comfotable long hours of writing. Whats Special about the "I Can"- The "I Can", as the name suggests is a pen with an attitude. It is gauranteed to stand apart and win every race. Its been designed to give maximum comfort and balance. If you are preparing to write uninterrupted for a day..this is the pen you should carry. The "I Can", comes with a stock F nib of good quality. If F is not your preferred width, you may choose to upgrade for a M width by choosing a Made In Germany nib (JoWo standard International #6 nib). 1) The 'I can" is a very handsome pen. The Pen is joy in itself! 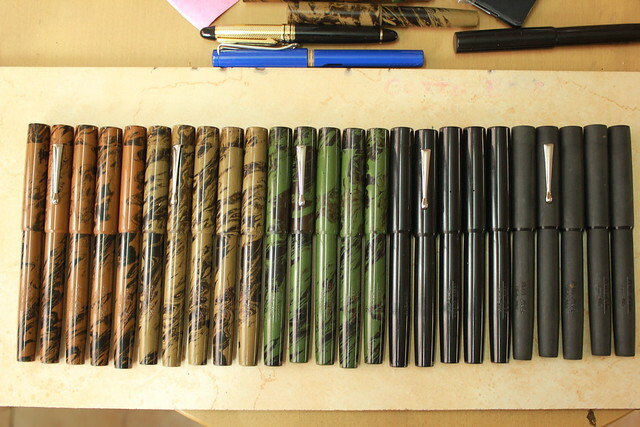 3) Its a completely handmade pen, everything is hand finished giving every detail attention.